You can get 50 FREE photo prints at Target this week. Target has their 4×6 photos on sale for $.10 each right now. 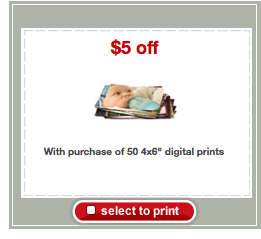 Stack that with this new $5 off Target photo coupon and get all 50 prints for FREE! Final Price: 50 for FREE! The link is for 8×10. They must have got rid of it already. There is a free 8X10 coupon under the “photo” tab, but there is also a $5 off coupon on prints and a $5 off select photo gifts under the “electronics” tab….I hope this helps! My Target isn’t showing a sale on prints online.. am I doing something wrong? I never understand why all corporate stores aren’t running the same sales all over?